On-Premises Enterprise Storage as a Service: Storage which is deployed on-premise, but is purchased based on consumption. Pure Storage has completely surpassed Zadara Storage after a three-year streak with Zadara Storage as Market leader. 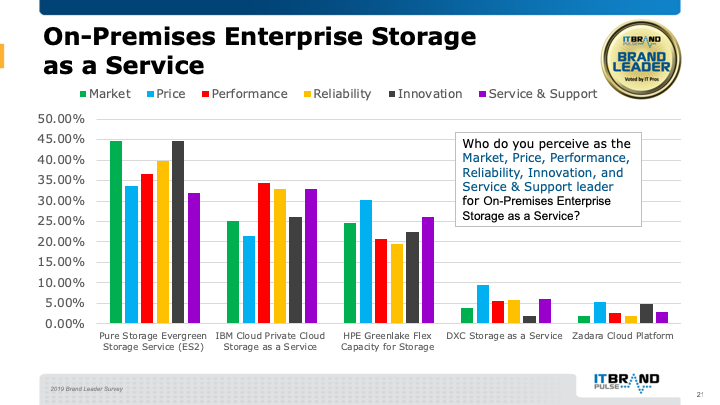 In addition to Market leader, Pure Storage nearly swept the board, also recognized for Price, Performance, Reliability, and Innovation. The title for Service and Support was a close call with IBM coming out on top. In another tight race, IBM was voted second for Market leader followed by HPE.